Port Macquarie, 호주의 비치사이드 백팩커스 | 호스텔월드에서 예약하세요. 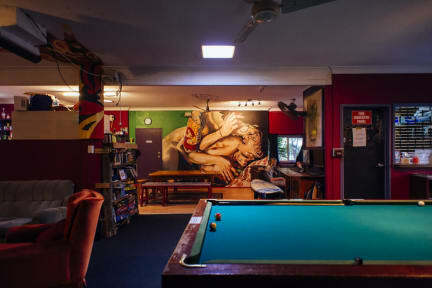 Beachside Backpackers has all the free stuff you could possibly desire. Free unlimited high-speed WiFi, free greyhound shuttle bus 8am-8pm, puppy that wants to take guests for walks, $4 shuttle to the coastal walk, free professional pool table, Free playstation 4, (complete with Fifa 18 and much more), $1 professional Italian foosball table, free netflix, smash bros & Mario Kart, midday checkout of room, free tea/coffee/sugar, free book exchange/ board games, quizzes, pool/ foosball comps and much more. We also offer $15 surfboard hire and lifts to the closest beginner surf beach every morning. Our location is perfect; we are the closest hostel to everything that matters. We are the only hostel within easy walking distance to the beach and koala hospital, we are also the closest hostel to the bars and town centre. Just check out our location on the hostel map view thingy! We are not the closest hostel to Mordor if you happen to have a ring you are trying to dispose of. We don’t turn the lights off at 22:30. We love the night – we love to socialise. So 24 hour kitchen and lounge area are yours. 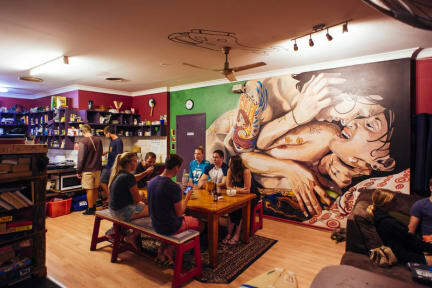 Our main aim is to make you feel like the hostel is your home too. We created this hostel for you. Yes, specifically for you. If you choose a different hostel it will be like we planned you a party and you didn't show up. If you’re arriving on the 5am bus and have not paid for the previous night you can’t access the hostel before 8,00 am as sometimes we need to sleep :) You can come up to the hostel, there are comfy lounges on the side of the building, you can also watch the sunrise over the ocean only 5 minutes away and there is great coffee shop not far from the hostel.